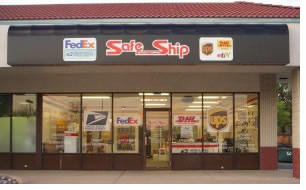 Safe Ship® Franchise Store means SUCCESS. Our franchise model store is an up to date, constantly growing, "LIVING" model store. Unlike the other franchise Pack 'n Ship companies, with Safe Ship you are not dealing with a salesman. You are talking with people who are in the store every day. The highly experienced people you will rely on daily for your success. Our training and support teams work in our model store. They have "TODAY" business understanding and are up-to-date in the changes and growth that is happening in the industry – TODAY. Safe Ship leads the industry. We have introduced many of the changes and new ideas in the Pack 'n Ship Industry. 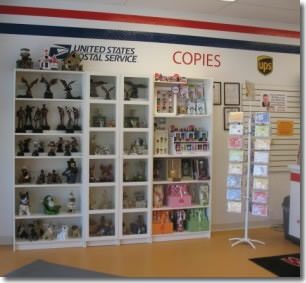 Our franchise model store is the largest pack & ship store in the USA. We are a Post Office® Work Share Partner. We provide all Post Office™ services at the same price as your local Post Office™. Plus FedEx, DHL, Greyhound GPX and full truck freight service including importing and exporting. ALL available mailing and shipping services for small business, home office professionals, road warriors, eBay shippers and the general public are supplied by Safe Ship. Safe Ship has developed and builds our very own heavy duty box making machine, the BoxMakerPRO™. This allows our stores the ability to make pallet covers and any size custom box, at any thickness, for any need. Only a Safe Ship store can do this. Plus we supply envelopes, bubble envelopes, standard boxes, padded envelopes, office supplies and everything you need for your work from home office needs. Your Safe Ship® store is a full service business center offering an array of business services including notary services, incoming and outgoing fax servive, mailboxes, mail forwarding, color copies, internet downloading and printing, and so much more. Safe Ship has developed several different franchise business opportunities to meet the varying needs of our pack and ship store franchisees. #1 – Safe Ship® Turn-Key Pack & Ship Store Franchise Program beginning at $69,900.00: After your first week of comprerhensive training in our corporate store in Florida, you will do your final week of training as we open your very own Safe Ship® Store. We set up everything. You learn the equipment and do your final week's training as we open YOUR store. This store is designed to do all shipping business modes including, freight, import, export, water air and ground container and LTL/LCL shipments and has our patented high value BoxMakerPro box making machine and more. 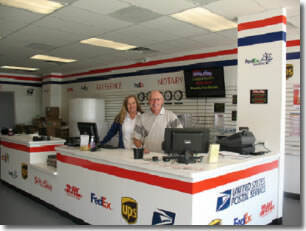 Standard shipping via USPS, FedEx, DHL, GPX, various trucking companies and various other desired services are included. #2 – Safe Ship® RFD Pack & Ship Franchise Program: This is the perfect rural America mailing and shipping store. The RFD Store is available in small towns with a population of 25,000 or less within a 10 mile radius of the potential store. As the United States Postal Service cuts saturday service and continues to close Post Offices in rural America, Safe Ship has the perfect Post Office replacement PLUS a limited service Pack and Ship store program. The Safe Ship RFD Store Franchise Program begins at $39,900.00 It is only available in small towns. The Safe Ship® Franchise Business Opportunity allows you to develop your Packing & Shipping Store with your personality added. Safe Ship is here to partner with you to help you make more money. We assist you where you need us. We are your mentor, your partner, your helper, your business reference point. Your Safe Ship® Store is a service business. Your main business is packing and moving shipments from point A to point B, world-wide. Whether it is a 33 cent post card to Aunt Millie or a 2009 Honda Accord to Helsinki Finland, you can ship it; next day air, water container or over the road freight. Related services include the preparation of items for shipment. The packing, partial dis-assembly of items and any paperwork required for shipping. You can also sell envelopes, padded envelopes, boxes and packing materials such as bubble wrap, peanuts, and brown paper to those individuals who wish to do their own packing. You are also a home and small business hub. Your services include providing copy service (both color and black & white), incoming and outgoing fax services, and notary service. Your Safe Ship® Store will also be a local Post Office with all the services you would find at any United States Post Office. You will be a center point for road warriors and other traveling business people. A very profitable related service is freight shipping for large items, and high value articles. Your Safe Ship Store can ship furniture, estates, gold, and vehicles – anything. You will be able to save the local businesses in your area money on their shipping by working as a logistic center for their freight shipping. You will be able to add on other services as you want. As an example, we have stores that have added on U-Haul truck rentals, stores have added greeting card sales and one store added Utility Bill payments as an added service. Each area has different needs that you can address to add additional profit centers. Our goal is the same as your goal. We want you to make money. You have the ability to mold your store – to make it fit you and your personality. We're looking for franchise owners who are outgoing and have and are not afraid of hard work, and who are results oriented. A person who can build relationships,and who has the motivation to excel! You must have a minimum of $50k in liquid capital, and be ready to make a full-time commitment. Safe Ship is currently accepting inquiries from the following states: Wyoming, West Virginia, Wisconsin, Washington, Vermont, Virginia, Utah, Texas, Tennessee, South Dakota, South Carolina, Rhode Island, Pennsylvania, Oregon, Oklahoma, Ohio, New York, Nevada, New Mexico, New Jersey, New Hampshire, Nebraska, North Dakota, North Carolina, Montana, Mississippi, Missouri, Minnesota, Michigan, Maine, Maryland, Massachusetts, Louisiana, Kentucky, Kansas, Indiana, Illinois, Idaho, Iowa, Hawaii, Georgia, Florida, Delaware, Washington, D.C., Connecticut, Colorado, California, Arizona, Arkansas, Alabama, Alaska.